The Bible – Written by man but inspired by God. The Bible is the most important book given to humankind. For all of those who have read the entire Bible, in the end, you are given a choice. That choice determines your eternity whether you believe in it or not. Then there is this warning in the final chapter of Revelations. Most people hear about God before they read about God. For many people, besides hear about God from family, friends and other people, most people hear a message about God for the first time in a church or TV, Radio or on a Digital Device. When in a church, and eventually almost everyone goes to one in their lifetime, the Acoustics and Sound System combined can determine if a person can understand what is being said or not. When a church has good Acoustics and Sound System, everything that everyone hears is the almost the same as the sounds that were created. When a church has good reverberation, that sound effect does not change the quality or accuracy of what is heard. When a church has poor acoustics and/or a poorly designed or adjusted sound system, what is heard and understood is often changed from what was said or sung. That change of what was said could be enough – and it often is – that it changes the meaning of what was said. The broadcasting of sound in a large room carries a huge responsibility. When the words spoken by the minister is one thing and what is heard by the time it arrives into someone ears meters away becomes something else, that is like adding or taking away the message of the Bible. The changed words can have a huge impact on a person life. Who is responsible for controlling how a worship space performs? Here is an example. Try saying these two sentences in your church. Have your minister say these two lines without pauses as they would do at any time of worship. If the listeners can’t tell these two sentences apart or they sound the same your worship space has a serious problem. 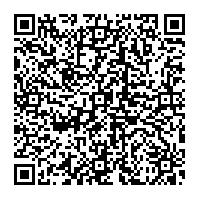 (Should You decide to do a real aural speech test, you can follow the link below and print out this speech test and try it at your church. Ultimately, that responsibility of how well your worship space performs lays with the church board, church leaders and the minister, who should be demanding the best. The acoustics of a church is a tool to preach the Gospel. The sound system can only work as well as the acoustics of a room allows it. You can only tune, redesign, and use the best state of the Art technology in a sound system and get only so far, and then there is no choice but to fix the room. Most Sound Equipment manufacturers do not care if people in a church cannot understand the message because the room changed the words. They just want to sell equipment and make a profit. Instead, equipment manufacturers keep making claims and promises as is if their products, their algorithms, and their digital technology is going to push the limits of physics. When you read some of the claims and advertising, if you know the science, often their claims seem to ignore physics. Physics comes from God. Do we know everything about physics? Probably not but what we do know about Physics and Sound has not changed in the history of man. Many churches are so caught up with getting the latest and greatest technology that they put off fixing their acoustics – which is cheaper to fix – waiting for the next round of technology to miraculously break the laws of physics and make physics bow down to them. Church leaders should not be forcing people to put up with the bad sound that changes the meaning of Gods message. Short of giving everyone a Bluetooth headset when you enter a church, the acoustics of your church is critical in whether or not a person is hearing the message word for word as a minister speaks every syllable. Hearing the Gospel is the most important thing that happens in a church. Singing and praising God together is the strongest thing that a church does to build a community. When that is followed up with fellowship, having meals together and helping people in your community, your neighbour and local town you are in, that is the full package of what a House of Worship does for the people. 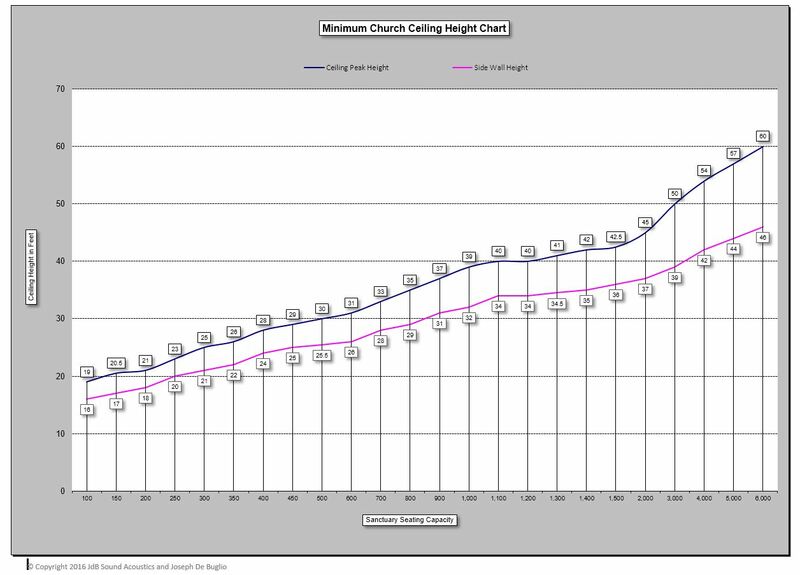 Church acoustics is not complicated, nor is it expensive to change. The Bible tells us how to get Church Acoustics right and affordable. 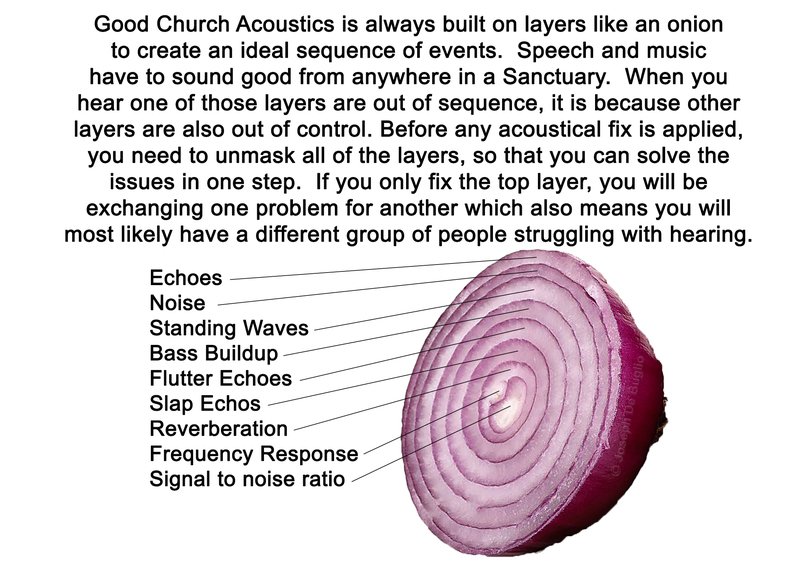 Sadly, there are many “experts” who make church acoustics seem complicated and expensive. As long as people are spreading around such myths and those who hear these myths keep on believing them, many churches are convinced that good acoustics is beyond their financial abilities. As a result, many churches are left not living up to their obligation in creating a worship space where no words are altered and the message is so clear that people are able to make that critical decision of where they will be spending their eternity. Finally, for those churches that have poor acoustics and the leading members who have the position and authority to make the changes to make the church building to be included in fulfilling the Great Commission, the book of Revelation is clear. For those who refuse to take the courage to make a House of God a vessel that can fulfill the Great Commission, God promises them “plagues of the Bible” or “God shall take away his part out of the book of life, and out of the holy city, and from the things which are written in this book.” As a person who has heard many ministers, one thing that is often said is that God does keep his promises. If this makes you feel uncomfortable, it should. Eternity and having a relationship with God is important. No one should be denied the opportunity to choose and your sanctuary should never get in the way of that. Most existing churches can fix their own acoustics. There are dozens of examples on my website of churches that have made the change from a bad room to a great room. If your church looks like one of those, you can copy them and get similar results. If your church is not comfortable with DIY, give me a call. For most churches, that is all that is needed, just a phone call and those are free. If you need further help, I can recommend someone else to help you or myself. Watch out for the Aesthetics Police! Here is a simple truth. Acoustics is all about the math and a combination of a variety of principles of physics – at least that is how I do acoustical design. Then there is the aesthetics. Here is a second truth. If a room sounds great for worship, speaking, music and children’s programs, people don’t pay to much to the aesthetics. It becomes easier for them to pay attention to the message and join in on the congregational singing. However, if what is on the walls doesn’t significantly improve congregational singing and all of the other aspects of worship, then what you have is wall furniture and it has to look great considering how expensive that it is. The installation shown above was done by church members. Originally there was a different design based on the same concept. Once the church members understood my plan, they suggested this. With a few adjustments, this is what worked. 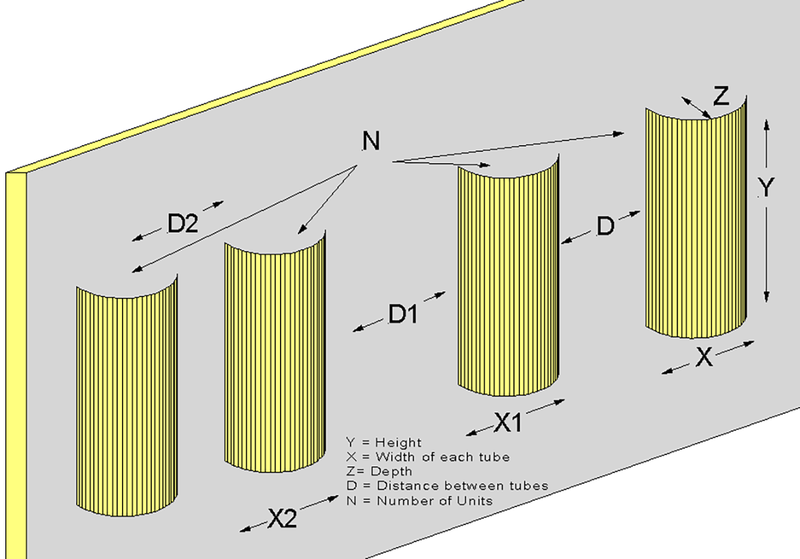 This did cost more than half round tubes but it is way less expensive than the alternatives. Believe it or not, it also meets fire code. How good is your worship experience? Sound Systems play a large part of the picture. The sound system is used 100% of the time in most churches. That includes streaming, hearing impaired systems and recording of the worship program. However, a sound system broadcasting live sound to the audience can only perform as well as the room allows it. Sure, getting the latest and best State of the Art Technology in sound does sometimes gain you a slightly better level of performance but how good can a sound system be? If we do a checklist of all the things a sound system is supposed to do, most churches that don’t have any acoustical treatment only get about 50 to 60% out of their sound system’s performance regardless of the quality of the equipment and the design of the speaker system. When a church does get the right acoustical system or if the acoustical system is built in, those churches get over 85% performance out of their sound systems, even when using just entry-level professional live sound equipment. Churches that have the right room shape that is within the Golden Ratio, they usually get a performance level over 90% out of their equipment with the right acoustical management system. An example of system performance would be in how much gain before feedback there is. In one church, they had so much gain before feedback after their church had an acoustical change, that during a children’s play, one child was helping another child who was struggling with their lines. The nearest microphone was over 9 feet away. The sound operator was able to raise the gain to where you could hear both children. This in itself was no big deal but it was huge for the parents listening to the play. They loved what they heard. When the parents could hear the one-child coaching the other with their lines, it was a great example of how people need to encourage each other and work together. Both children were complimented for their performances. The parents felt included in all of the things happening on stage. In most churches, experiences like this never happen. Instead, most parents complain that they couldn’t hear their child or the other kids, or get upset with the sound guys for not having enough microphones for them, or get upset with the Sunday School teacher for not teaching the kids how to use microphones. The performance of a sound system can make the difference between having a blessing and hearing the message or being so distracted that person leaves upset and any message given is totally missed. In another example, a church had floor monitors that were so loud that the main speaker system couldn’t be used without blasting everyone in the audience. The monitors are almost as loud at the back of the church as well as up front. The worship team switched from floor monitors to in-ear monitors. At first, it seemed to work. However, if you were sitting in the front 5 rows of seating, the sound coverage was poor in about 70% of the seating. Before, the floor monitor spill helped to fill in the coverage of the shortcoming of the main speaker system design. After getting the in-ear monitors, the church went through 3 speaker systems and 3 different speaker system layout designs. The coverage issues never were resolved, even with loudspeakers recessed in the front of the stage on delays and the whole ten yards. The shape of the church didn’t help either. Eventually, the church had to fix their acoustics because those front 5 rows of seating were always 80% occupied and that is where the Pastor’s wife always sat. With sound coverage issues resolved, the acoustical fix also resolved a boat load of problems including monitor spill. The acoustical fix made it possible for the worship team to go back to using floor monitors months later. The church was only a 500 seat space and over a 6 year period, they spent over $200,000 on just speakers, processors, amplifiers and mixers. the acoustical fix was only $4,000. 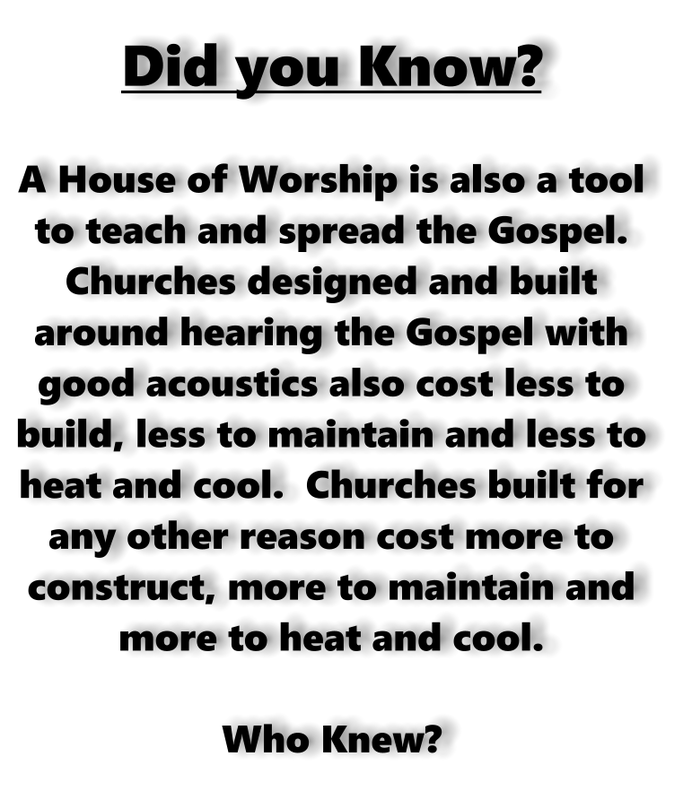 Had the church addressed the acoustics first, they would have had an extra $150,000 invested into other programs or missions or helping church growth and health. Many churches are going through this process today. A lot of churches just keep taking the “Blue pill.” Churches with money keep turning to esoteric audio hardware and hope that physics will take a back seat to the latest technology and software to help them. For churches that don’t have the funds, they just put up with bad sound and for some, declining or very high turnovers in attendance. For those churches that take the “Red pill,” they spend way less on sound equipment and have systems sounding and performing in ways other churches can only dream about. 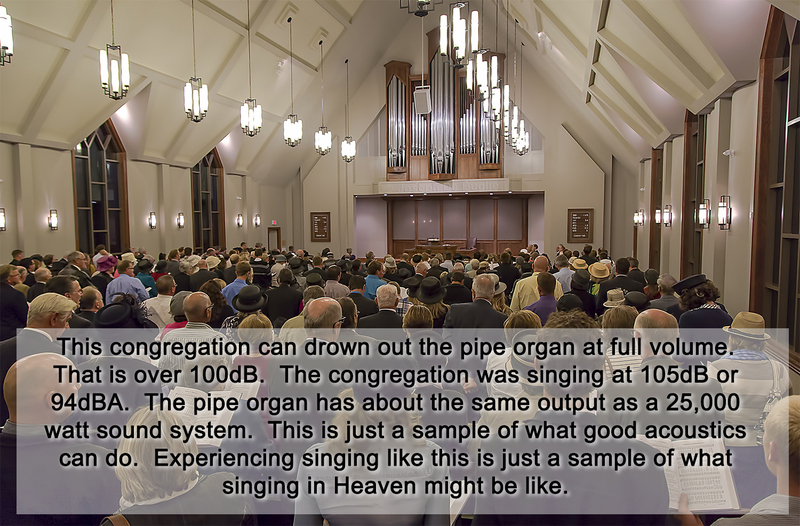 These same churches have more enthusiastic congregational singing, better sound teams and almost zero complaints about the sound, even when the sound system is keeping up with a congregation singing over 95dB! Some Worship team members find that their talents improve. Ministers find that more people are paying attention and are asking questions or commenting on the weekly sermons through the week.